(Nanowerk News) Human teeth have to serve for a lifetime, despite being subjected to huge forces. But the high failure resistance of dentin in teeth is not fully understood. An interdisciplinary team led by scientists of Charité – Universitätsmedizin Berlin has now analyzed the complex structure of dentin. At the synchrotron sources BESSY II at HZB, Berlin, Germany, and the European Synchrotron Radiation Facility ESRF, Grenoble, France, they could reveal that the mineral particles are precompressed. The internal stress works against crack propagation and increases resistance of the biostructure (Nano Letters, "Compressive Residual Strains in Mineral Nanoparticles as a Possible Origin of Enhanced Crack Resistance in Human Tooth Dentin"). 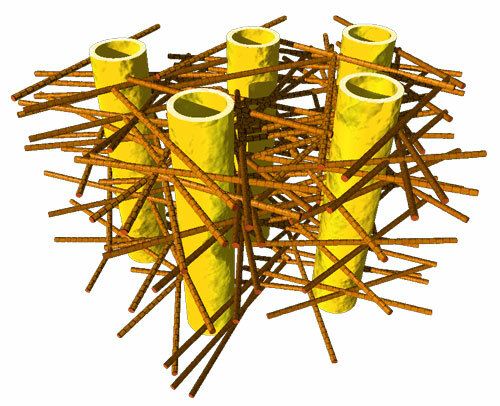 Engineers use internal stresses to strengthen materials for specific technical purposes. Now it seems that evolution has long ‘known’ about this trick, and has put it to use in our natural teeth. Unlike bones, which are made partly of living cells, human teeth are not able to repair damage. Their bulk is made of dentin, a bonelike material consisting of mineral nanoparticles. These mineral nanoparticles are embedded in collagen protein fibres, with which they are tightly connected. In every tooth, such fibers can be found, and they lie in layers, making teeth tough and damage resistant. Still, it was not well understood, how crack propagation in teeth can be stopped. Now researchers from Charité Julius-Wolff-Institute, Berlin have been working with partners from Materials Engineering Department of Technische Universität Berlin, MPI of Colloids and Interfaces, Potsdam and Technion - Israel Institute of Technology, Haifa, to examine these biostructures more closely. They performed Micro-beam in-situ stress experiments in the mySpot BESSY facility of HZB, Berlin, Germany and analyzed the local orientation of the mineral nanoparticles using the nano-imaging facility of the European Synchrotron Radiation Facility (ESRF) in Grenoble, France. When the tiny collagen fibers shrink, the attached mineral particles become increasingly compressed, the science team found out. “Our group was able to use changes in humidity to demonstrate how stress appears in the mineral in the collagen fibers”, Dr. Paul Zaslansky from Julius Wolff-Institute of Charité Berlin explains. “The compressed state helps to prevents cracks from developing and we found that compression takes place in such a way that cracks cannot easily reach the tooth inner parts, which could damage the sensitive pulp”. In this manner, compression stress helps to prevent cracks from rushing through the tooth. The scientists also examined what happens if the tight mineral-protein link is destroyed by heating: In that case, dentin in teeth becomes much weaker. “We therefore believe that the balance of stresses between the particles and the protein is important for the extended survival of teeth in the mouth”, Charité scientist Jean-Baptiste Forien says. Their results may explain why artificial tooth replacements usually do not work as well as healthy teeth do: they are simply too passive, lacking the mechanisms found in the natural tooth structures, and consequently fillings cannot sustain the stresses in the mouth as well as teeth do. “Our results might inspire the development of tougher ceramic structures for tooth repair or replacement”, Zaslansky hopes.